The Incas started around 1438 and lasted 55 years under the rule of a father and then his son. The Inca territory covered nearly 2500 miles from today's Quito, Ecuador to the Maule River in Chile. The Inca's quick expansion was a result of a few military battles that influenced other rulers to cooperate. The few brutal military victories suffice to terrify other petty rulers into cooperation, and the success of the Incas derives partly from excellent roads and communications. Incas 2500 miles of terrain varied that covered the northern part of today's Chile, the western part of today's Peru, Ecuador, Bolivia and Argentina. It was made up of large areas of jungle, desert, and rock-strewn highlands. Many roads were more like paths that had to be kept clear. They even used rope suspension bridges make crossing deep ravines possible. 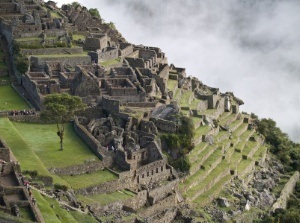 They developed a terrace form of accomplishing agriculture to make use of every square foot of mountainous terrain.